This article originally appeared in the print version of the 2019 Landowner Newsletter. According to the 2017 USDA Forests of Minnesota Resource Update, approximately 17.7 million acres (35%) of Minnesota’s total land is forested. While forests predominate in the northern and eastern part of Minnesota, forest and woodland areas can be found statewide. Given the high percentage of forest in our state, forest health is a topic of interest to many of our landowners. Unfortunately, the prolific nature of our forests is connected to a flux of forest pests and diseases. In this article, we will address two of the pests currently impacting Minnesota forests: Oak Wilt and Emerald Ash Borer. Oak leaves with discoloration symptomatic of oak wilt disease. Oak wilt is a plant disease caused by an invasive fungus, which can invade the plant’s water-transfer system (xylem) underground, or through sap beetles above ground, who can transfer fungi spores through their eggs when moving from tree to tree. Currently oak wilt affects oak trees primarily within southeast and east-central Minnesota. Nationally, oak wilt has been documented in 24 states, with a concentration in the Midwest. Although this disease can affect most of our native oak species, northern red oak and northern pin oak are the species with the greatest risk of infection. 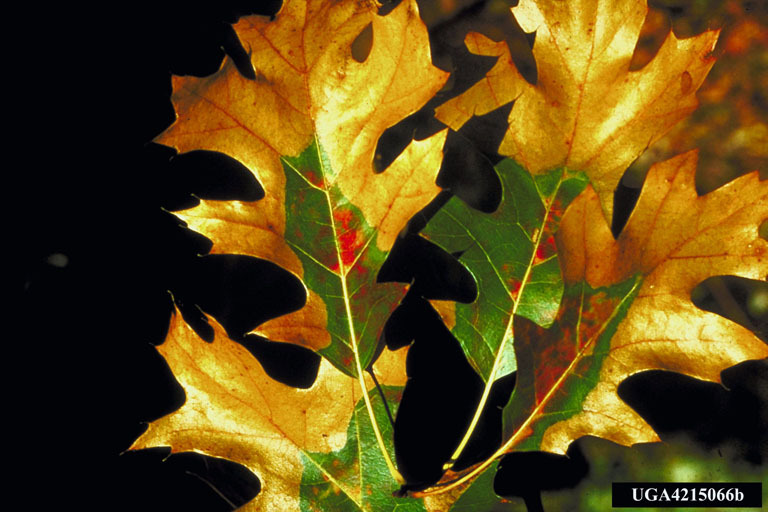 One of the first signs of oak wilt, is a reddish-brown discoloration along the midvein of leaves. This discoloration may spread across the entire leaf, and infected trees may begin dropping their leaves soon thereafter. Unfortunately, oak wilt is fatal for trees within the red oak family (northern red oak and northern pin oak). For oaks within the white oak family (white or burr oak), progression of the disease is more gradual, often allowing time for intervention by tree care professionals. The best strategy to preserve healthy oak trees, is to prevent the spread of the fungus itself. The University of Minnesota Extension recommends not pruning or harvesting oaks in oak wilt counties between April and mid-July to avoid fungi transmission. They also recommend you remove or treat diseased specimens in a timely fashion, in order to minimize disease spread through insects. Lastly, don’t move logs or firewood from infected trees to areas where oak wilt isn’t present. If you suspect your trees may be infected with oak wilt, consult the University of Minnesota Disease Clinic, your local DNR office, or an experienced tree care professional. Another pest currently affecting forests in southeastern Minnesota, the Twin Cities metropolitan area, and Duluth, is the Emerald Ash Borer (“EAB”). EAB is an exotic insect originally native to Asia, known for its deadly effect on ash trees throughout the U.S. 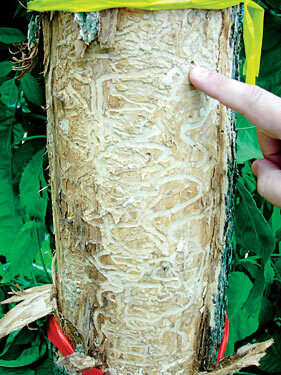 The first documented appearance of EAB in Minnesota, was in 2009 in St. Paul. A year later, EAB was located in greater Minneapolis and other locations in southeastern Minnesota. With nearly one billion ash trees estimated in Minnesota, EAB poses a significant threat to forests statewide. Starting in the late spring, adult EAB will emerge from infected trees to feed, and lay eggs within bark crevices of ash trees. After the eggs hatch, hungry larvae tunnel through the cambium (inner bark) of the tree, disrupting important vascular tissue in charge of exchanging nutrients and water from the roots throughout the tree. The larvae will feed on the cambium for one to two years before creating a shelter cavity and transforming into its pupal stage in the spring. 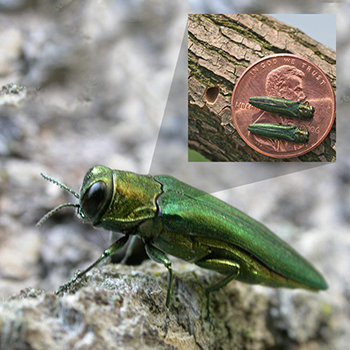 Ultimately, the larval life stage of the EAB is the most destructive to ash trees overall. In early summer, pupae transform into adult beetles, and escape the cambium by chewing d-shaped exit holes in the bark. As an adult, EAB measures approximately 1/3” to 1/2” long, and has iridescent emerald- copper green coloring throughout its body. A copper colored patch behind the head may also be present. Adults live for a total of three to six weeks. The most common symptom of EAB damage, are the d-shaped exit holes created by emerging pupae in spring. These holes typically measure approximately 1/8” in size. Another tell-tale sign of EAB, is s-shaped tunnels underneath the bark. These markings are caused by the larvae zig-zagging while feeding on the cambium. Once trees have started to display symptoms of EAB, they can die within one to three years. A “gallery” of s-shaped tunnels beneath the bark of an ash tree is one tell-tale sign of emerald ash borer. Photo credit: Forest Service, USDA. The most effective method for controlling EAB, is prevention. As with oak wilt, refraining from transporting firewood (ash, oak, or otherwise) from outside your immediate area is a simple way to keep forest pests from spreading. Although ash trees may be effectively treated with insecticides in the early stages of infestation, this option is often not economically viable in many situations. Instead, many owners may opt to remove and/or replace diseased trees with other DNR recommended species. Contact your local tree care professional for more information on safe removal of EAB infected trees. In addition, the State of Minnesota has undertaken biological control measures to control EAB spread at a landscape scale. This control method involves the release of three species of stingless parasitic wasps that attack EAB eggs/larvae. To obtain assistance with evaluating the condition of the forest on your property, a great first step is to consult with your local MN Department of Natural Resources office. There are also several great online resources related to the detection of forest pests, management of infected trees, and recommendations for the selection and care of replacement trees. These resources can be found on webpages maintained by the MN Department of Natural Resources, the MN Department of Agriculture, and the University of Minnesota Extension. Prior to undertaking any action, we also encourage landowners to review their conservation easement and contact the Land Trust with any questions regarding their plans to remove and/or replace trees. In addition, be sure to provide the required notice and obtain Land Trust approval as stipulated in your easement. The trees recommended for replacement can be found at: https://extension.umn.edu/tree-selection-and-care/recommended-trees-minnesota .